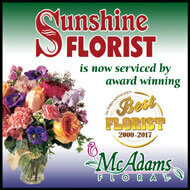 - "McAdams Floral is truly an outstanding and a most reputable company to use. They are indeed a dependable group to use for any occasion or a unique seasonal gift or arrangement"
- "...I had to tell you thank you for the floral arrangement you sent my wife for our anniversary. She was overjoyed with the colors and the personal touches... 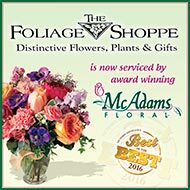 Your staff has the gift of putting a smile and happy tears on people's faces..."
- "McAdams Floral is my favorite...I always receive great customer service...I applaud this kind of service, for it is rare in our business world today." - "The services rendered, often on very short notice, have always been carried out with the utmost care... It makes my job easier knowing that I can always rely on McAdams Floral..."
- "Just wanted to let you know what an awesome employee you have with Mrs. Pam. She takes so much pride in her work, you would think that because of her 'go the extra mile' attitude and service, she might be a part-owner..."
- "...I just wanted to share with you that your 'magic with flowers' added a bright spot for many people these past days. I only regret that roses can't live forever. Thank you for brightening my birthday!" - "A friend recently brought me an arrangement of fresh flowers to cheer me up. When I saw it, I exclaimed, 'Oh wow, that's a McAdams!' Your unique touch really sets you apart from the rest." - "You and the staff at McAdams carried out our wishes in the most thoughtful, caring way. When Marguerite Heller and I had the appointment with you, you listened and understood what we wanted, guiding us toward our goal of an appropriate remembrance. The flowers were so fresh and beautifully arranged in the easel spray. It was so large, it exceeded our expectations. We heard many nice comments on it." - "Thank you for making the celebration of Cloie Wilson's life so special with the beautiful arrangement for her casket. Her favorite flowers were roses and carnations and your designer created a lovely and truly exceptional bouquet of them to honor Cloie." - "Just to say how lovely the floral spray turned out. It was really beautiful." - "I know the flowers we selected were going to be pretty but I was not expecting the most beautiful casket spray ever- so soft and peaceful. Please thank Emily for me – she is so very talented. Daddy loved flowers and he would have been pleased. Thank you for helping make stressful decisions easier." - "Just wanted to say a JOB WELL DONE!! The arrangement I ordered online was beautiful. I expected nothing less from McAdams. Thank you for so many years of dependable and wonderful service." - "Dear Ginger & everyone at McAdams, Thank you! We were very selective about who we worked with to make our wedding everything we wanted it to be. Ginger was especially great to work with. She is knowledgeable and professional and her contribution played no small part in our special day. All of the arrangements were beautiful and exceeded even our high expectations. Many of our guests complimented the flowers and we knew were sincer. Honestly, we can't say that we would have changed anything or done anything differently. So, thank you for making our most special day that much more perfect."